When Chuang Tzu was about to die, his disciples began planning a splendid funeral. But he said: “I shall have heaven and earth for my coffin; the sun and moon will be the jade symbols hanging by my side; planets and constellations will shine as jewels all around me, and all beings will be present as mourners at the wake. I’m with Chuang-Tzu. I prefer to be cremated and my ashes strewn in a wonderfully serene and contemplative forest pond—food for the turtles. 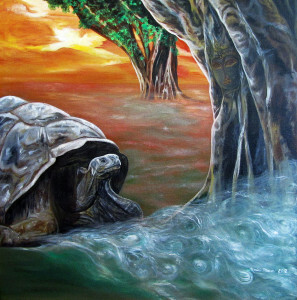 Chuang Tzu often used that turtle-imagery. He must have loved them. In another story he talks about a tortoise called Dark Spirit “for whom spring and autumn each lasts five hundred years.” They are indeed such lovely and con-templative creatures; if you look closely (click-on) at today’s accompanying image you will discover a Buddha’s face in that tree beside the tortoise. An apt image, I think, to conclude this Chuang-Tzu series. He was a grand contemplative person, not a mystic in the esoteric sense, but rather a Mystic of the Tao, bearing no fixed position, and just being responsive to the breath of the Unborn Spirit. This entry was posted in Chuang-Tzu and tagged Chuang-Tzu, Dark Spirit, Spirit, Zhuangzi. Bookmark the permalink.